The Good: James Wan (Director) is a probably one of the best directors to do horror in our generation. He's done other movies such as Insidious, The Conjuring, Saw, and Dead Silence Movie. (BTW, he's also directing Fast & Furious 7). So yeah, James has earned my respect in the movie making business. The suspense of this movie doesn't disappoint. While it's not directly "In your face" scary, this movie's atmosphere screams creepy. It's to the point that you would never want to trade places with any of the characters in the movie. The story line is probably the best part of this movie because it's so layered. Dare I say it's probably the first time I've seen a horror film dig ALMOST as deep as Inception. (Yup I said it) So be sure to pay close attention. Oh and most surprisingly, this movie actually has some funny scenes. Those ghost hunter guys provide much needed comic relief aside from the time you're gripping your seat from all of the suspense. The Bad: While the story line is masterfully done, it can be confusing for a few reasons. If you haven't seen Insidious 1, then you'll definitely miss out on the connections the movie tries to make. If you're the type to get up during the movie and go get food or take bathroom breaks (pet peeve), then you'll definitely miss out on some parts of the movie. Because the movie demands that you pay such close attention, I can see casual movie goers potentially being lost and confused during many parts of this movie. The Reason: You should watch this movie because this is how horror movies are supposed to be done. The director doesn't do the lazy job of just using the stale, over used formula that we've come to see in recent horror films. The horror and suspense do not take long to pick up, and the movie's run time will not make you go to sleep either. Again, I'd recommend seeing the previous movie first because this sequel ties into the first one, and does a lot of jumping back and forth in time. 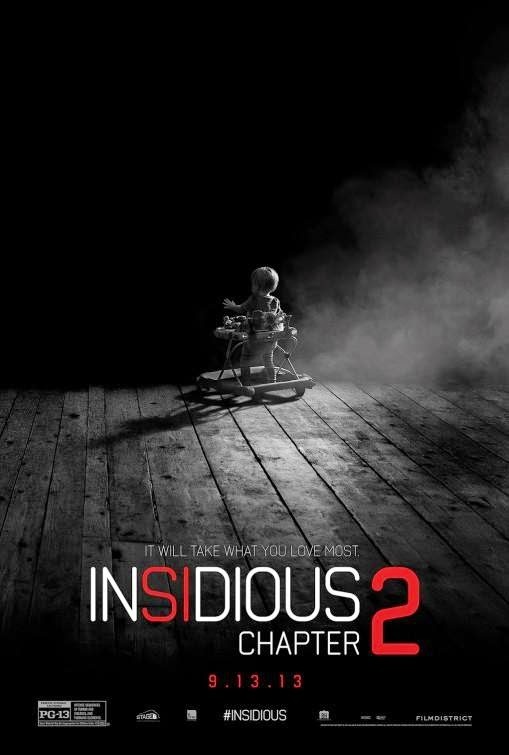 (sort of) If you don't feel like watching the original again, (which you should because it was good) then feel free to read the wiki page of Insidious so that you at least won't be completely lost. I would definitely recommend this as theater watch, given that you follow my advice above. Besides you'll probably want to watch this in the theater anyway because creepy movies like this may not be that easy to watch at home, at night, by yourself, in the dark!